Welcome to Carnival, where deception, intrigue, and mystery all go hand-in-hand as you participate in the masquerade of a lifetime. Make sure you wear your Venetian Vanity Ring as a part of your stunning ensemble. This stunning ring is anything but simple, as it is made from pewter and takes the shape of a classical masquerade mask. The mask is divided into two distinct sections. The upper half of the mask, above the eyes, is coated in translucent blue enamel, while the lower half, beneath the eyes, is coated in translucent red enamel. The edges and eye-lines of the mask are decorated by flowing, artistic lines of pewter, which add a sense of exotic beauty to the mask. 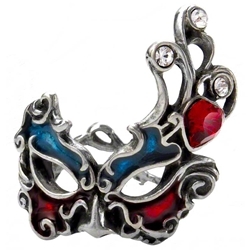 A pewter off-shoot rises from one side of the mask as well, and is decorated with one red Swarovski crystal as well as three smaller white ones. You may not be able to disguise your identity with this beguiling baroque mask, but you can certainly add a touch of masquerade-born mystery to any look with the Venetian Vanity Ring.